One of our best selling carrier bags, a gorgeous Brown Kraft Paper Carrier Bag with Twisted Handles. These bags are made from recycled Kraft and do not feature a ribbed effect. These are the ideal economical alternative to our Italian Brown Ribbed Kraft Carrier Bags with Twisted Handles. 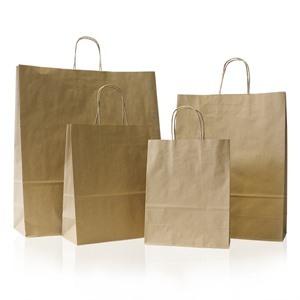 Made from recycled Kraft paper with twisted paper handles attached to the inside of the bags. Please note that recycled Kraft is not as strong as pure Kraft paper. Most commonly used in gift stores, boutiques, clothing outlets and other retail stores for small items. Flat block bottom suited for boxes and other containers, the bags are suitable to hold up to 2-5 kilos in weight depending on the size. Our stock of Twist Handled Paper Bags are our most popular range of Paper Bags, we are able to print them with your chosen design. If you need a special size we can even have the bags hand made in the far east to your specification.